Seven people were injured in Tel Aviv by a Palestinian who rammed a stolen taxi into a police roadblock outside a nightclub and then got out of the car and began stabbing people. 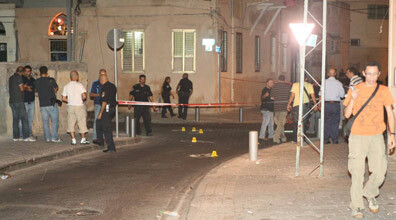 The attack took place early Monday morning outside the Tel Aviv nightclub Haoman 17. The 20-year-old attacker, a resident of the West Bank town of Nablus, was subdued and taken into custody by Israeli police. The man hijacked a taxi at 1:30 a.m. and some 10 minutes later drove it into a Border Police roadblock protecting the nightclub, which was packed with more than 1,000 high school students attending a party, The Jerusalem Post reported. The attacker then got out of the car and shouted “Allahu Akbar!” — Arabic for “God is great!” — as he assaulted people with a knife. According to The Jerusalem Post, five of those injured in the attack were members of the Border Police. One of those hurt in the attack was seriously injured, two were moderately injured and the rest were lightly injured, the newspaper reported. Police prevented a huge catastrophe by stopping a Palestinian Authority terrorist who wounded eight people at a Tel Aviv nightclub patronized by approximately 2,000 young people. Border Police had been preparing for terrorist attacks, and their presence enabled them to stop the terrorist, hailing from Shechem (Nablus) in the Shomron (Samaria), before he could continue his assault with a knife. The police “prevented a big disaster,” said Police Commander Yochanan Danino. Dozens of police officers brought down the terrorist, age 25, after he hijacked a taxicab, wounding its driver, and was surprised by a police roadblock, which he slammed into. He then drove on for another half a mile. He then reached a nightclub holding approximately 2,000 young people at a party and continued knifing his victims for a short while until police, alert to his presence and therefore out in numbers, apprehended him. One Border Police officer suffered wounds in his neck, and the taxi driver was cut on his hands when he tried to yank the knife away from the terrorist. All of those wounded suffered light to moderate injuries. The Palestinian Authority has not commented on the terrorist attack. Shechem, from where the terrorist arrived, is under control by the Palestinian Authority, which is committed to dismantling the terrorist infrastructure. “The incident was further proof of the motivation of terrorists to attack,” Danino said. The attack still is under investigation, but the Public Security Minister said that the terrorist appears to have acted on his own, bearing out warnings from intelligence officers that “lone terrorists,” without direct involvement of a terrorist organization, are prepared to carry out attacks at any time throughout the country. A high alert against terror is in effect along the southern border. Six people were injured in a terror attack in southern Tel Aviv overnight Sunday. The attack occurred after an Arab stole a taxi, ran over a man and lightly injured him, then stabbed several other people at the corner of Abarbanel and Salame Streets in the city. Magen David Adom reported that one person was stabbed in the head and stomach and was very seriously injured, two people were moderately injured and two others were lightly injured. They were all taken to Ichilov Hospital in Tel Aviv. Voice of Israel radio reported that the attack took place near a popular Tel Aviv night club, and that the terrorist called out “Allah Akhbar” as he stabbed people. It was also reported that he refused to heed the officers’ calls from him to stop, a fact which strengthened officers’ belief that the man is a terrorist. The terrorist was lightly injured as police took over the cab and apprehended him and was taken to the Wolfson Medical Center in Holon. Police are investigating the incident, and a preliminary investigation has found that the terrorist came from the Shechem area. He initially made his way to Yafo, where he stole the cab and made his way towards southern Tel Aviv. 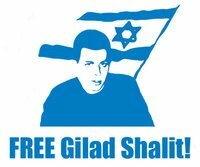 Captured Israeli soldier Gilad Shalit spent his 25th birthday in captivity. Sunday was the sixth birthday that Shalit has marked in captivity since he was captured by Hamas terrorists in a cross-border raid in June 2006. Shalit’s parents led a protest in front of Prime Minister Benjamin Netanyahu’s office in Jerusalem on Sunday, with banners reading “We won’t let Gilad celebrate alone.” Another banner called on Netanyahu to give Shalit “his life back” for his birthday. While Israel’s skies are still raining rockets despite an alleged “ceasefire” local radio announcers are broadcasting bravery to bolster its citizens who are facing the fire. After days in which mortar shells and missiles of all ranges have been fired at southern Israel, local radio announcers have been reviewing the defense instructions of Home Front Command – and stressing the importance of following them to the letter. “When one hears the air raid siren, one must immediately proceed directly to a safe space,” a radio announcer quietly reminded his listeners in a calm voice during a recent broadcast on the popular local southern radio station, Radio Darom. “One does not need to run, nor does one need to panic. There is a full minute’s travel time for the missile to reach Be’er Sheva from Gaza, 60 seconds, in which to find shelter – more than enough time,” he said soothingly, “so don’t run. Just don’t dawdle. If you are traveling in a car, park and leave the car. Knock on the nearest door or enter the nearest shelter. “I am sure that anyone with a shelter will share their safe space with you in such times,” he added in a comforting tone. The announcer also reminded listeners not to leave the shelter for at least 10 minutes after impact is heard in order to be sure there is no secondary attack. He called on residents to stay indoors and avoid gathering in public places, even though many have expressed real curiosity about the Iron Dome anti-missile system and the desire to watch it in action. “I know that the Iron Dome looks like fireworks (when it operates) and it draws people out on the streets,” Danino said, “but we must put a stop to it. We need to put our curiosity aside,” he appealed. Even though the Hamas terrorist rulers of Gaza allegedly initiated a ceasefire late Sunday night, the so-called truce had already been violated more than a dozen times within its first 24 hours. It was also unclear how many of Gaza’s numerous terrorist organizations have actually signed on to cooperate with the agreement.